The Avon Trail Rider Tires are rugged and reliable on/off road tires for your bike. I only have about 2500 miles on the tires so far but these are becoming my favorite tires I’ve had on my bike ( KTM. 1290 SA). They seem to be wearing well and considering how well they grip I’m happy. I've had these tires for less than a year. I bought them so I could safely commute to work during Seattle's rainy season. They are VERY noticeably grippier than my last set of tires. I've noticed for a while now though that some cracks were developing in the sidewall of the tire. I had to replace a tube today, and when I had the tire off the wheel, I gently bent the sidewall of the tire. The cracks are BIG. The tread on the tire is still very good, but I'm going to have to replace the tire anyway due to dry cracking. Very upsetting. I put these on my Kawi Versys 650. They worked extremely well offroad even in mud and I never found a sitution where I didn't have enough grip in the wet or dry. The problem is that they were completely worn at about 2500 miles. They did not last as long as I had hoped. With proper pressure and alignment they wore completely evenly and the same front and rear. Both tires need to be replaced after 2500 miles. It seem wrong for me to type that both tires are completely worn after 2500 miles. Great tire for big ADVs! I have used 4 different tires on two R1200GSWs that I've owned, and these are my favorites by quite a margin. The Michelin Anakees (two versions) that the bikes are currently shipped with are noisy and deliver a harsh ride. The previous OEM tire, the Metzeler Tourance, wore in a strange fashion and gave low confidence on gravel roads. These Avon Trailriders are smoother/softer riding, quiet, and stick very well on asphalt and concrete. Using them on track days, you can easily get heat in them and they take on the handling characteristics and appearance of a softer tire - very confidence inspiring. The grooves are wide enough to shed small pebbles, reducing a bit of the squirm on gravel roads. Wear is on par with the Anakees with the dual-compound high silica content rubber; I get about 4500-5000 miles out of a set, including a track day and hard Sunday sport rides thrown in with the utility riding, but don't buy my tires for mileage. Just a great tire for these bikes! Bought these with just street riding and mild adventuring and some dirt road trekking in mind. Terrible in grass but anything but knobbies are as well so nothing to care about there. Pretty good in looser dry dirt and mild sand. Excellent on street and here's the kicker. The thing I was blown away by. It's fricken incredible on the track! Obviously not like a full blown race slick or even a track orientated street tire but my God for what it is, it is so damn sticky. I have been doing track days and racing for almost 2 full seasons on these tires, and street riding, and they just keep taking the abuse. The lean angle isn't nearly as steep as a race tires BUT, if you find the edge and hold it there, it won't let you down if you understand what you're asking it to do. Deep lean and a heavy snap of the throttle can break it loose but if you have some finess, you can easily beat sportbikes in the corners on tracks made for sportbikes. I know because I have been doing it. So to summarize. Pricey, and heavy but very versatile. I don't think you'll be disappointed. Ok with 6,000 miles on them, they are still adequate tread but it looks like 7,000 miles on the rear and maybe 10-12k on the front. Notably, the tire is not squaring off like every tire I ever had and traction is still excellent. This bike has been sport ridden, dirt road and highway and I am very impressed with these tires. Cornering traction is excellent. Probably will push the rear a little out there on mileage and swap them both at the same time. The dual compound they are using is very successful as shown by the still round tire. The wet performance on the street has been very good. Dry dirt roads are very good. Mud? Well it's a bit slidey on that. Like many others, I was influenced by the "earthroamers" blog to purchase Avon's Trailrider tires, not realizing Avon was one of their sponsors. I normally run Metzeler Tourances on my F650GS twin, but I thought I would try something that might be better on gravel without sacrificing good behaviour on the street. Initially I liked the Avons - they have very good road manners with a smooth, quiet ride and good grip even in the rain. The Avons are at least equal to the Tourances on the street. In gravel they are also the equal of the Tourance, and perhaps are even bit better in the rear. But like the Tourance, the Avon front still washes out on gravel turns with any kind of speed. BUT, and its a big but, the front tire has developed a headshake at just over 2500 miles. Nothing radical or scary, but still present and annoying, and seems to be getting worse. The bike checks out OK and the tire was balanced so it seems the tire is starting to wear unevenly already. I am meticulous about tire pressure and run 32psi in the front and anywhere from 36 to 42 psi in the rear depending on whether I might have dirt or gravel on the ride that day. The rear is starting to square off already, and no way will it equal the 7500 miles I typically get with a Tourances rear. The Avons are a dual-compound tire and it seems the center is too soft - my bike is not overly heavy or powerful so I imagine a larger bike will eat an Avon rear in no time. I really wanted to like these tires but both front and rear are a disappointment compared to Tourances. I though of trying the Avon Trekriders since they are not a dual-compound tire, but I am now a bit sour on Avons. I guess I'll pull the front Avon and put on a new Tourance till the rear Avon wears out and then I'll just stick with Tourances. As the tile says I've put around 3000 miles on these so far. Kind of a weird style of tire to put on my bike, 09 Kawa Er-6n, but I love them. I live in rural VA and ride on gravel/dirt/grass fairly often so I wanted something that could handle those fine and I haven't been disappointed at all. Ignore my rating on treadlife, since I'm still using them and they haven't worn out yet I'm unsure on the total treadlife. What the hell is this guy using these tyres on a BMW R1200RT-LC?? I use my Beemer as a TOURsport, in as I travel on America's, and Canada's back roads, with a 90-95% straight up, and the rest in the twisties, with a .05% with surprises. turn around. When I bought these tires, I suspected that Avon might be using the same rubber compound as their other sportouring tires that have a 15,000 mile warranty, and to a certain extent that is correct, except I had the rear tire nearly wear itself out within 500 miles running from Ontario OR to Price UT. What happened was, I had already had these tires on for 6,000 miles and they looked nearly brand new, so I decided not to change them out, and in a few weeks I left from Olympia WA to Dallas TX some 2,200 miles. In Snowville UT I stopped for gas and noticed that the rear tire was wearing down the center, and reduced the tire 2 PSI to have it begin to wear more on the shoulders of the tread, and off the center, with the hopes of getting to Dallas, it worked! The situation was that in the highland desert with temps in the 90-105 range, and running at 80 MPH +5, the rear tire won't hold up, but as I'm nearing the 12,000 mark the front looks fantastic. roads, and on pavement, BUT during a long winter storage the tread develop's a kind of a blue finish that requires the tires be carefully scrubbed in as they become slick. NO tire is perfect for everything and this is no exception... I've been on a search for a good balance of compromise over the past several month's on my 2017 GSA and this one is a pretty good choice... of course it came with the Anakee 3's which were really nice on pavement and not great off road... tried the Shinko 705 and while those were fine new they wore VERY fast and wont go there again... the Avon's are very nice with LOTS of grip on pavement for the first 3-4k miles... as good as A 3's IMO and better off road than the A3's. After about 4k miles I noticed the front getting sketchy when leaning and the rear had about 5k and was ready to come off... still plenty of tread on the front but like I said... sketchy while leaning now that they are worn. Overall, I'd say this is a very nice tire if you're mostly paved with some hard pack off-road stuff thrown in. If you're 50/50 then keep looking... If you're all paved stick with the A 3's (assuming you like them) I plan to give the TKC 70's a try next. Read a review from several long-distance riders and decided to give them a try. Have ridden on Avon tires previously. Needed a pavement/gravel tire for a trip to Alaska. Great looking British tires for a British Triumph Tiger 800, why not? I've had great results with Avons before with a Triumph Bonneville. So here I go again! I was at home on Heidenau K76, but, each year tire companies put up something with tempting new compounds and designs, so I figured I'd try. Plus, they advertise building tires for the UK climate, and I figure Virginia (USA) weather is about the same. I ride year-round, over mostly asphalt, with some gravel and hard-pan. A 90/10 tire should work. After reading the reviews on this site and other. I've had other brands but never an Avon and decided to give them a try. Wanted great grip on the street and be able to do a little gravel road now and again. I'm the second owner and the previous owner put pure street tires on it and I'm in tulsa ok. There are some great gravel roads to the east in the Ozarks. Decent cost and had good reviews. One of the few tires that fit my '96 DR350 for mostly road use. Bought them for my CB500X and really like that they will go anywhere I want to go!!! Good traction, smooth and quiet tires. So this set is for my husband NC750X. Will see how he likes them! Needed new tires and never had Avons before. Thought I'd try them. 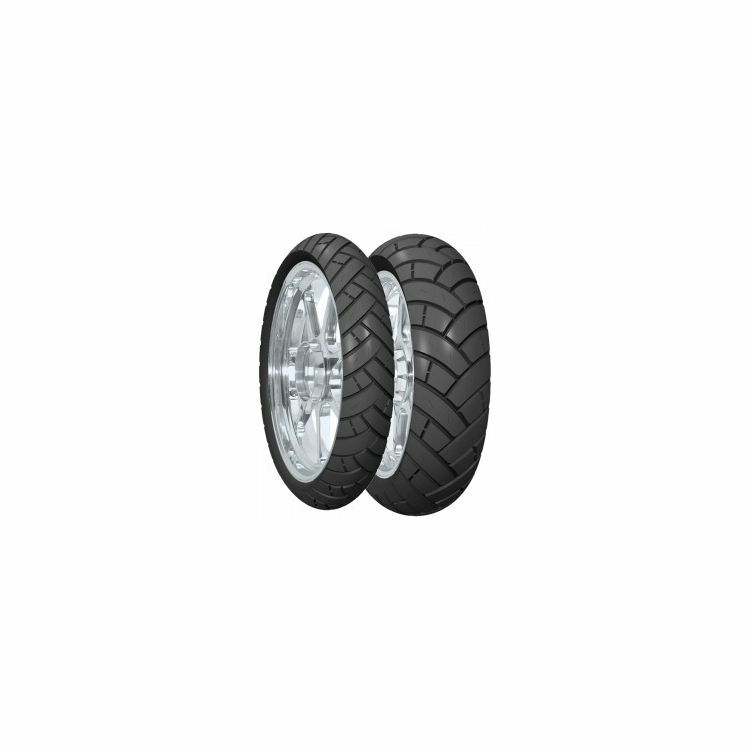 What is the mileage expectations with this new tire compared to the original Avon Distanzas? BEST ANSWER: Avon engineers estimate the mileage to be very similar to Distanzia, perhaps 5-10% increase depending on application. The grip, stability and handling of the TrailRider is night and day better than Distanzia. There are some Avon long distance riders have achieve 15,500 on the rear TrailRider and the front is still going strong. Can the 110/80-18 58S TL be used on the front? It is listed as a rear tire. BEST ANSWER: One of the things that makes America so great is the we always as "I wonder if..." But in your case carefully look at all of the 18 inch tires either on the front or rear listings to double check if there isn't a front tire listed. If not, you may try then on the front anyway to see how the bike handles with the proviso that it may not work well for your bike. Is the rear 120/80-18 radial construction? BEST ANSWER: It depends on the size. If there is an R between the size and the radius, it is a radial. Thinking of putting these on a 74 yamaha 650TX that I am building up. Seem to be close to what I am looking for. They are offered in both bias ply and radial option depending on size. what is the speed rating in this tire? BEST ANSWER: It depends on which tire you pick. They are rated S,H,V,W and now Z depending on the size. Is this tire suitable for use with a tube? Does it fit with a BMW R1200 RT 2006? Reason: Dalton Highway, AK, in August. You need a more aggressive tire for the dalton. I ran heidenau k60 scouts on a gs 800.
what load rating are the 179/60R17 TL's ? and whats the fr as well on the 110/80R-19 TL front? What is the speed raiting on these tires? I would like to know the age of the tyres that came into your possesion.Was it over a year?